● This is a perfect size to store and organize in any room in your home. ● Keep one by the back/front door and have a perfect place to keep the keys, cell phone, mail. ● The family room - holds CDs or DVDs, many remote controls we have or books. ● Personalize the powder room/bathroom with one. Can hold an extra roll of toilet paper or decorate with some fun towels. ● The kids room – hair accessories, DS / video games or small toys. ● This would make a perfect baby shower gift - fill it with nursery / baby items. 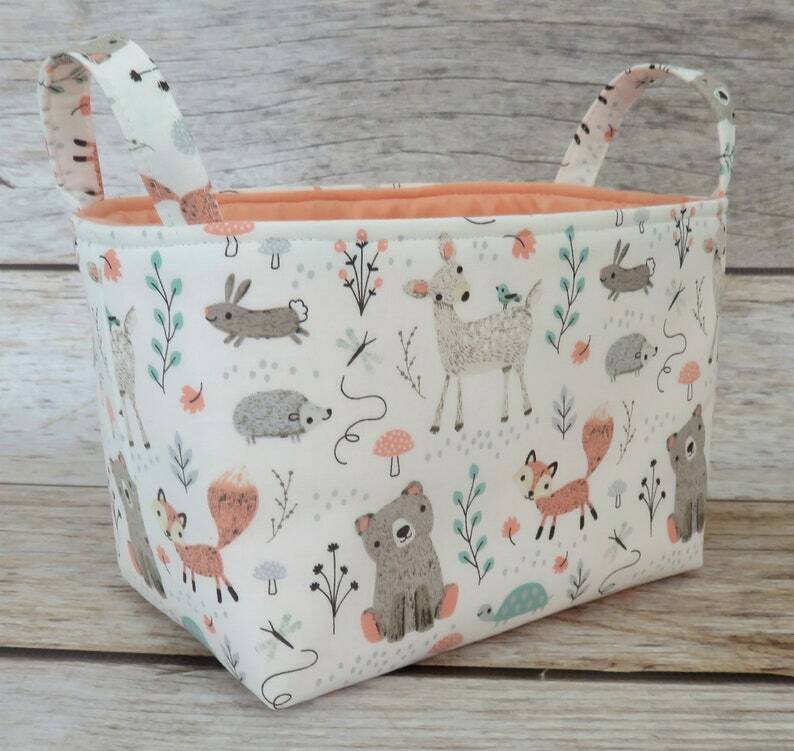 ● Woodland Baby Animals - Bear Deer Fox Fabric for the outside. ● Cotton fabric for the inside/lining. Choose your fabric at checkout. Peach with Mini White Dots or Taupe / Khaki Quatrefoil fabric. ● Interfaced to give it a nice shape and also has a layer of cotton batting to give it additional support and softness. ● Placement of fabric design may vary slightly with each individually made item. ● Measurements - the item measurements are listed below - so you know the size you are purchasing. If you have any questions, contact me prior to purchasing, please. Each item is handcrafted - measurements may vary slightly. Hand or Machine wash cold on gentle cycle then line dry. Steam iron can be used to remove any wrinkles in the fabric. This is just the cutest bin. I bought 2 for my daughter's baby shower. It will go perfectly with her woodland animal theme. Absolutely gorgeous and very well made! Fast shipping! I bought 3 of them for my grand daughter's nursery, however, I wanted a much larger one! I think it's great quality and adorable! Beautiful basket! Very well made, the basket has good structure and does not sag. After I print the shipping label - Etsy will send you an email with the tracking no. Please note the estimated date of delivery so you can be on the lookout for your package. If your item is lost in the mail (the post office deems it lost after 30 days) I will either offer a refund or a replacement of the item you purchased. I am not responsible for items that are marked as delivered and you do not have the package. Please contact your local post office if this happens - they can help you track down your package. If your package is returned back to me for incorrect address, I can reship to you - but you will be responsible for the additional shipping charges to resend. What if I as the Buyer changes my mind and don't want the item? Of course, you may change your mind, I accept returns - but in that case, you can expect to pay the shipping to return the item(s) to me - I will process a refund for the amount of the item only.